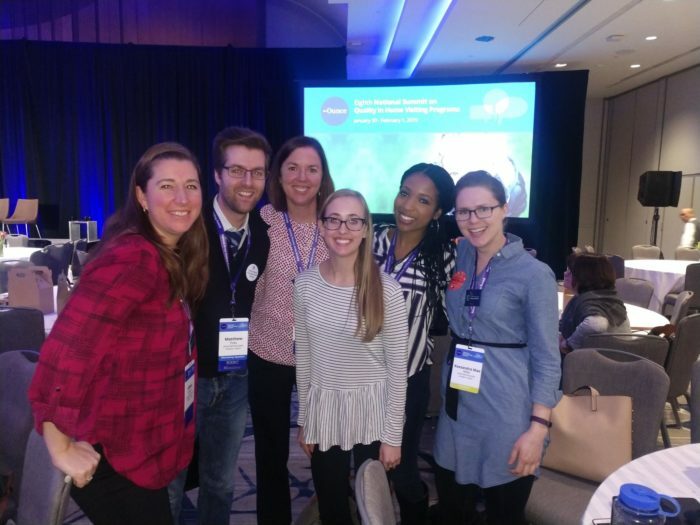 Members of the JBA team joined hundreds of colleagues in Washington, DC, last week for the Eighth National Home Visiting Summit on Quality in Home Visiting Programs. The annual event, hosted January 30 to February 1 by the Ounce of Prevention Fund, brings together professionals seeking to advance the field of early childhood home visiting. JBA staff joined the Summit in a variety of roles. Matthew Poes helped lead a workshop on using innovative research methods to achieve precision home visiting. He was joined by fellow presenters Lauren Supplee, Allison Kemner, and Cesar Zuniga. Allison Meisch and Kassie Mae Miller presented a poster on the National Home Visiting Resource Center’s efforts to depict the national home visiting landscape. Jill Filene, Susan Zaid, Grace Atukpawu-Tipton, and Ashley Kelley attended Summit plenaries and workshops to gather research ideas and network. As in years past, the Home Visiting Applied Research Collaborative held its Collaborative Science of Home Visiting Meeting in the hours before the Summit. JBA staff joined project partners from Johns Hopkins University and Child Trends to deliver workshops on precision home visiting interspersed with 15-minute research presentations by members of the collaborative.